All 19 Regions of the AIA have representatives on the Council. Some have multiple members and some of the AIA Board and past Board are on the Council. The total of the Council members in 2018 was 49. For the past three years I have been on the Council representing the International Region. I will now be replaced by Greg Yager, AIA of Shanghai Chapter. 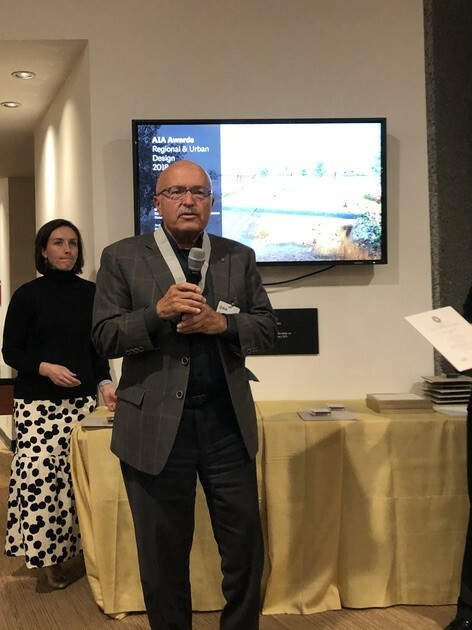 We were also fortunate to have another International Associate AIA be selected to the five un-affiliated members for 2019, Nela de Zoysa, Hon FAIA, Hon RIBA, and other Architectural Associations based in Sri Lanka. The charge to the Strategic Council is to be the “big thinkers” and advisors for the AIA Board. We meet 3-4 times a year and have telephone conversations monthly or more. The organization of the Council is by their Class of three years and these Classes have telephone meetings for their own specific interested in architecture and related subjects. Environment, Sustainability, Resiliency, Diversity, are just some of the subjects. We developed 10 ideas this past year for the Board to review and take into consideration from about every subject that would affect architects from new graduates to those who are semi retired and still very vital and available for their knowledge and expertise. Many of these concepts and programs will continue with the 2019 Council and they will also develop additional programs. I am attaching a draft program (here) where I participated for the last two years. The Council also votes on the various awards presented by the AIA including the prestigious Gold Metal. Specific to their expertise many of the Council members are on advisory groups for the Board. I have been on the International Practice Committee Advisory Group (IPCAG) for many of the past years. I believe it is vital that the International Representative with the support of Nela work to advice, remind, and continue the work Tom Vonier, Thierry Paret and I have done over the past years to project the vitality, uniqueness, and importance of the Region to the AIA.